Saturday, October 14, 2017, 11 a.m. to 3 p.m. Discover how trend-setting neighbours in the Sooke region are tapping nature’s energy grid, modernizing time-honoured natural building techniques and finding creative ways to minimize their environmental impacts while saving money in the bargain. The second Sooke Ecohome Tour on Saturday, October 14 offers six examples of how the common-sense energy revolution is taking root locally. Three homes are in Sooke, three in East Sooke. The search is also on for a seventh stop: Not an ecohome* persay, but rather an average Sooke household that can showcase energy conservation best-practices. Interested homeowners are invited to email sooketransition@gmail.com by Oct. 10 if they’d like to serve as this year’s model of the possibilities. 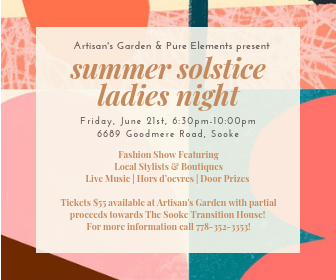 Tickets: Nice-priced tickets ($5 per person/$10 per carload) will be available on event day *only* at the Stick in the Mud Coffeehouse (corner of Eustace and Otter Point roads in downtown Sooke) and at participating venues. The tour is free to pedestrians and cyclists. The Rainbird Ridge Econest, an off-grid home under construction on farmland near East Sooke Provincial Park. Built with local natural materials (straw and clay included) and designed as a sustainable, long-lasting healthy home. Features include a Faswall (recycled pallet-based) foundation, passive solar design, a masonry heater, heat exchange water heater, earthen floors and greywater irrigation. 310 Becher Bay Road. Hosts: Shyanne Smith and family. Talk by KC Natural Homes’ Keary Conwright at 2 pm. A 238-sq ft tiny temple house built this year on a rural property in the forested depths of East Sooke as a retreat and working space for professional health practitioners Vibeke Vaerum and Michael Cruickshanks. Featuring hand-tooled wood frame construction with almost entirely wood finishings, it was completed without drywall or paint for health, environmental and aesthetic reasons. Rainwater harvesting and composting systems. 1635 Selborne Drive. Guest: Builder/designer Forest Adam from Homes With Love. A town centre Sooke home with 14 solar panels (300w photovoltaic, installed last year by Viridian Energy Co-Operative) that have lowered the annually averaged hydro bill to a $56/month. The panels also power an EV charger for a 2017 Nissan Leaf. Other features here include a solar hot water system that preheats city water before it gets to the electric water heater; and a beer-can furnace to warm the home’s crawl space. 2098 Solent Road North off Dover. Hosts: Gord Fulcher and Lis Johansen with Viridian’s Steve Unger. A solar-powered west-end Sooke permaculture oasis featuring a diverse food garden and an infrastructure that includes rainwater catchment, grey water irrigation, water filtration and a team of industrious chickens. 2179 Henlyn Drive. Host: Steve Hindrichs. A thoroughly modern farmstead in bucolic Otter Point with rammed-earth (clay, sand, cement) walls and roof-mounted solar vacuum tubes that power the radiant in-floor hot water system. 2358 Kemp Lake Road. Hosts: Christine Bossi and Martin Bissig. Talk by builder Keary Conwright at 11:30 am. Bonus: Enjoy a cup of Herbal Tea Station tea, harvested and packaged by Martin on site. Note: Organizers are seeking one more Sooke home to add to the tour. Might it be yours? No alt.energy extras required! If you’re an exemplar of household e-smarts — i.e., weatherproofed doors and windows, water-heater blankets, energy efficient appliances, LED lighting, perhaps a heat pump or wood-pellet stove — and are happy to welcome drop-in visitors, please email sooketransition@gmail.com no later then Tues. Oct. 10. We’ll assign a volunteer assistant to help you out on the day. Our goal: To demonstrate that proven, low-or-no-cost initiatives like your own are the starting point for everyone’s energy conservation gameplan. * According to our loose definition, an ecohome (new or retrofit) uses building techniques and/or technology to create energy savings and a substantially lower carbon footprint in construction and ongoing operation. Insulation, passive solar orientation, thermal mass building materials, renewable energy (solar, heat pump, biomass), rainwater harvesting, greywater collection and recycled building materials are considerations.